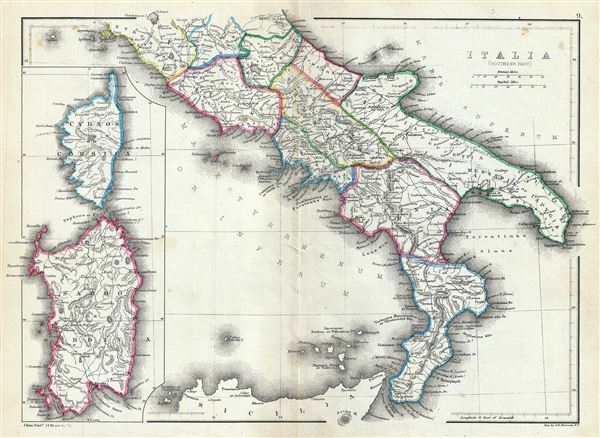 This is a fine 1867 William Hughes map of southern Italy during ancient Roman times. The map depicts the southern part of Italy from Lake Bolsena to Reggio in southern Italy. The map does not detail Sicily. An inset along the left border features the islands of Corsica and Sardinia. The map identifies a host of important cities and towns and uses ancient names throughout. The Roman regions of Latium, Etruria, Lucania, Brutii, Apulia and Campania are also noted. During the first centuries of the Imperial Rome, Italia was the territory of the city of Rome rather than a province, and enjoyed a special status such that the armies of military commanders were not allowed into the region. This map was created by William Hughes, printed by J. Bien and engraved by G.E. Sherman, for issued as plate 9 in Sheldon and Company's An Atlas of Classical Geography.